The new Lexus LS Saloon is one heck of an austere large car that boasts fantastic reliability, lots of comfort and an impressive list of standard kit. In fact, compared to rivals, the amount of standard equipment you get is so impressive that you won’t need to top it off with too many extras. So while the listing price starts from £100,700, that also includes a list of things that rivals don’t include as part of the showroom price. It’s a car that wants for nothing – not even a Blu-ray entertainment system. And reclining rear seats? Now we’re talking. As well as this, the LS should tempt green-minded buyers with its sophisticated hybrid model that does 0-62 in 6.1 seconds. This model is a result of Lexus’ twenty-year experimentation with hybrid tech, so expectations are high. However, rivals are now starting to play catch-up, as we’ll find out in this review. 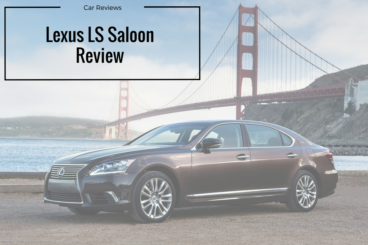 OSV takes a closer look at what it’s all about with our 2017 Lexus LS Saloon review. The LS is at its best when cruising on the motorway, its suspension setup is able to keep you comfortable. It’s smooth and accomplished. In the town, it’s a different story. Broken roads present it with a bit of a problem, and it’s not so adept at smoothing down fractured surfaces. Lexus have added Adaptive Variable Suspension to help solve this problem, but the issues still persist. Other criticisms of the driving experience include numb steering that hardly involves you, and frustrating brakes. They brake sharply, thereby lacking the smoothness you usually expect from a luxury limo. There are just two engines available. 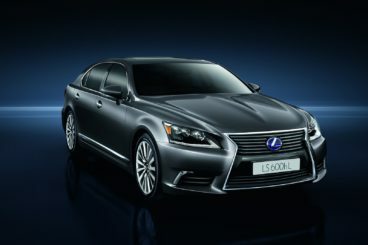 The sole petrol model is the Lexus LS 460 that’s powered by a V8 power plant. It develops 382bhp, and can get you from rest to 62mph in 5.7 seconds. That’s pretty quick, but the engine manages to stay fairly quiet. It’s refined, although the accompanying air suspension lets things down. Still, there is lots of grip. The hybrid engine is the real star of the show if you care about the environment. With low running costs and a 0-62mph time of 6.1 seconds, it’s an attractive proposition. It combines a 5.0-litre petrol engine with an electric motor, and offers the same kind of performance as its experienced German rivals. It’s expensive to buy, but gets a four-wheel-drive system as standard. However, the extra weight causes its own issues. The LS Saloon is a heavy car anyway, but chuck in the four-wheel-drive system and batteries and it gets even heavier. This has obvious negative impacts on the way the car handles. Add the hesitant and slow CVT automatic transmission, and it soon becomes apparent that the hybrid model is far from perfect. Its interior is the LS’s strength. It rivals the German luxury saloons when it comes to comfort, and offers a relaxing ride. The cabin is well insulated from external noises, with little – if any – wind, road or engine noise creeping in. The overall design is smart, and the finish is beautiful. It looks a tad dated compared to rivals, but the layout is free from clutter, and the dials are as clear as day. A 12.3” colour screen dominates the dashboard as only a 12.3” screen can do. But it’s controlled by a Remote Touch joystick which can be a bit fiddly. We have no complaint with the quality of the materials used. Lexus have splashed out on upmarket furnishings, and the construction is as safe as houses. Weirdly enough, though, the real wood and soft leather – while real – looks synthetic. In terms of how practical it is, the hybrid version naturally has a smaller boot, thanks to the electric motor. However, while the boot falls from 560-litres to 420-litres, the hybrid has a longer wheelbase than the standard model. This means that interior space is excellent. Aside from that, storage space is good. It includes big door bins, and plenty of cubbies. The seats are adjustable, and if you opt for the hybrid variant, you get reclining rear seats. Prices start out at an eye-watering £100,700. However, you get plenty of bang for your buck, with Lexus stocking the LS up with much more standard kit than rivals. 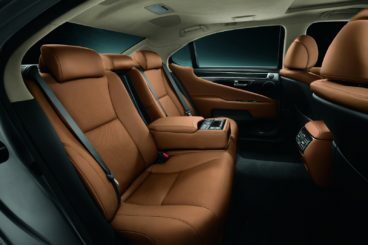 Optional kit is limited thanks to Lexus including the likes of electric rear blinds, voice-operated sat nav, air conditioned seats, a Blu-ray entertainment system, a Shiatsu massage function, a footrest and four-zone climate control as part of the list of standard equipment. It’s swanky stuff. Standard safety kit is good too, and includes adaptive cruise control, eleven airbag’s, a tyre pressure monitoring system, and electronic stability control. A lane departure system is also standard, as is blind spot monitoring. It really is a car that wants for nothing. Prices for the new car start out from £100,700 and rise to £102,200. If you prefer to lease, you can pick up a deal from as little as £1,490 + VAT per month. For more information on our leasing deals, check out our page here. In terms of its running costs, the LS varies from one extreme to the other. Go for the hybrid version and you can average returns of 32.8mpg. Go for the blistering pace of the petrol model, and economy returns hover in the 26.4mpg area. The harsh truth, though, is that the hybrid isn’t quite as efficient – or as green – as we would have hoped. It emits almost 200g/km of CO2, which is enough to put a pretty big dent in the O-zone. The hi-tech hybrid model benefits from two decades of experience with hybrid tech from Lexus. It’s refined – and so is the petrol engine. Standard equipment is so impressive that the list of optional extras is a small one. Included in the list price are electric rear blinds and a Blu-ray entertainment system. It boasts premium, limo-levels of comfort. It’s no surprise that the petrol engine only returns 26.4mpg at best, but more was expected from the hybrid model. The steering is numb, the gearbox is unresponsive, and the handling is flat. Humph. Let’s see how the car fares against its rivals in the comparison section of our Lexus LS Saloon review. Lexus has more experience with hybrid technology than BMW. But that counts for nothing here. The 7 Series hybrid can return 134.5mpg economy, and does 0-62 in 5.4 seconds. Impressive. Its numbers are better than the Lexus’ so far, and it also drives better. For such a big luxury saloon, the 7 Series is a different class on the road. It’s entertaining, agile, and involves you more than rivals. The 740e hybrid model comes paired up with a seamless 8-speed Steptronic automatic gearbox, while rear-wheel-steering can be added for £1,195. Doing so boosts agility even more, leaving the rather more cumbersome LS Saloon in its wake. The hybrid engine develops up to 322bhp. Despite being an engine clearly designed for lower emissions and better economy, it hasn’t sacrificed much performance. It does 0-62 in 5.4 seconds, runs on just electric for almost 30 miles, and has plenty of mid-range shove. It’s also remarkably quiet, smooth and composed. 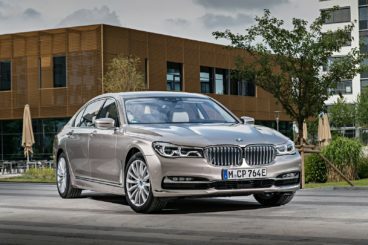 However, we’d caution against adding four-wheel-drive as it adds even more weight to the already heavy 7 Series Hybrid. Lightweight carbon core construction has shaved some kilos off the 7 Series’ total weight, though, and this helps to keep running costs down. BMW claim that the 740e hybrid can return 134.5mpg economy, but in the real world this will be hard to achieve. You would have to drive like a monk to get near those figures. Inside, the 7 Series is a seriously charming car. The materials used are all top quality, the design is stunning, and the advanced tech is state-of-the-art stuff. On the move, the hybrid is so quiet that you’d hear a pin drop, while the suspension setup is pillow-soft. The dash is hi-tech, and sports a crystal clear, large infotainment screen that houses the iDrive system. Rich wood trim is a luxurious highlight, while standard kit includes a three-spoke steering wheel and LED brake lights. The Lexus gets much more standard equipment, though, which explains why the BMW’s starting price is so much lower. How practical the BMW is doesn’t really hinge on whether you go for the short or longer wheelbase model. Both are roomy, with the shorter version now longer than last time. However, the longer variant is 14cm lengthier, which means that – like the Lexus – it can offer airplane-style interior space. Passengers in the back will be just fine, and you can choose to sit them in either a conventional three-seat back bench, or two reclining armchairs. Get you! The boot, meanwhile, measures 515-litres. It can’t be extended, because the car does without a split-folding rear seat. The new Porsche Panamera is a gorgeously crafted, superbly finished and super quick rival to the LS that doesn’t cost as much to buy outright. Its hybrid model is faster than both the Lexus and the BMW, taking just 4.6 seconds to cover the 0-62mph sprint. 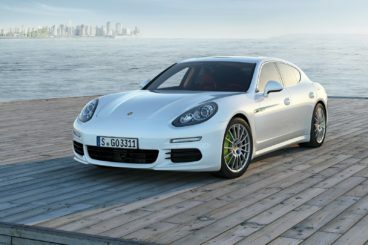 That’s staggeringly fast, and yet Porsche claim that it will return up to 113g/km of CO2. In the real world that will be hard to achieve, but the numbers are promising. The hybrid runs on electric power alone for over 30 miles, and can zoom along at speeds of 87mph. Bring the petrol engine into play, and you’ve got a powerful car on your hands. It sets off like a rocket, with its acceleration coming as soon as you put your foot down. The brake pedals are a criticism, though – they feel too artificial. This is down to a regenerative braking system that sends energy to the battery. At times, it can put a dampener on the driving experience. Other than that, though, there is plenty of fun to be had. The Panamera is at its hair-raising best in straight lines, but even on twisting roads it’s accomplished, despite its size. Inside, we can only give the Porsche 5/5. This is a sumptuously designed cabin. It’s well appointed, well built, and comfortable. The only disappointment is that, like the BMW, the list of optional extras is extensive. The Lexus has more – and better – standard equipment, which explains why the Porsche’s starting price is much lower. Despite all the power on offer, the Porsche is also a useful family car. When you’re not screaming down a remote country road, you can use the Panamera for trips to the local dump! It’s absolutely huge inside, with enough space for five people in both the short and long wheelbase versions. Leg and headroom is excellent, and if you truly want to keep your back-seated passengers happy on longer trips, you can add all-round ventilated massaging seats for just over £3,000. The boot measures 495-litres in the standard Panamera, which isn’t spectacular. The hybrid’s boot is smaller still, but you can fold the rear seats to extend it to 1,304-litres. The LS has a longer history with hybrid technology than any other limousine. However, hybrid tech isn’t its sole selling point. There is also a powerful and refined petrol engine available, lots of comfort, and more standard equipment than its rivals. The Lexus LS Saloon might be tagged with the “alternative choice” label, but we prefer to call it the smart choice.